A hard veil of censorship fell on the mainstream media during his administration, and any discussion by critics was typically smeared as racist. The US Intelligence Community was used to spy on, harass, and intimidate reporters and political opponents. Obama is arguably the worst president in U.S. history. Obama insisted on failed policies, such as ObamaCare, and yet had an arrogant dismissal of his critics. His presidency was marred by anemic economic growth, rising federal debt, his poor foreign policies and multiple political scandals Obama failed to see the political backlash against his presidency and said in February 2016, "I continue to believe that Mr. Trump will not be president." Despite framing himself as an advocate for the poor, speaking about income inequality and socialism, Obama is a limousine liberal as his life after his presidency atests. 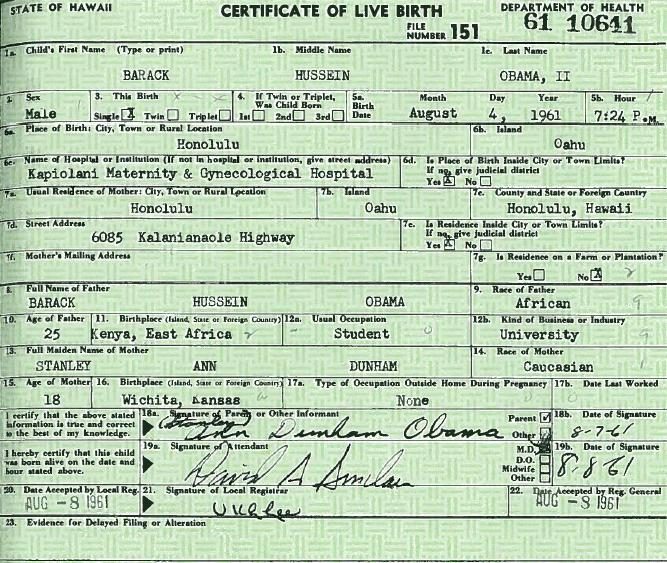 Obama claims to have been born in Honolulu, Hawaii on August 4, 1961, to Stanley Ann Dunham and Barack Obama Sr.—who had married just six months prior. Some contend that this story is a complete fabrication. After many leading conservatives—including the leadership of this site and Donald Trump—called for Obama to release his birth certificate, he produced a document that he claimed was his birth certificate on April 27, 2011. Sheriff Joe Arpaio of Maricopa County in Arizona conducted an investigation of Obama's eligibility and questioned whether the alleged "birth certificate" was a fake; however, no charges were filed. Obama was reportedly assigned a social security number whose first three digits was assigned at that time to applications coming from zip codes in Connecticut. As an interesting side note, the Hawaii official (Loretta Fuddy, State Health Department Director) who verified Barack Obama's birth certificate died in a plane crash. Besides Fuddy, Health Department Deputy Director Keith Yamamoto was also on board. The plane's engine had failed right after takeoff and crashed about a half-mile off Molokai's north shore on Dec 11, 2013, at about 4:00 p.m. Interestingly enough, Health Director Loretta Fuddy was the only death of the nine people on board; she died of "cardiac arrhythmia". Claims that Obama was born in Kenya can be traced back to sources close to Obama. In 1991, Obama's literary agent, Acton & Dystel, published a promotional booklet that stated that Obama was born in Kenya. The claim that Obama was born in Kenya remained on the agent's website until 2007. Internet archives confirm this information. In addition to the information from literary agents, Michelle Obama stated in a speech that Kenya is Obama's "homeland". At a speech in Kenya shortly after his presidency ended, Obama publicly stated that, "Now, three years ago, I visited Kenya as the first sitting American President to come from Kenya." Barack Obama Sr. was not a citizen of the United States. At the time of Obama's birth, Kenya was a British colony, meaning that not only was Obama Sr. a British subject, but he passed that status on to his son. When Kenya gained independence, Obama and his father both ceased to be British subjects and became Kenyan citizens. 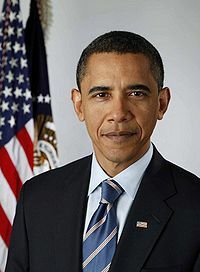 Barack Obama was a dual citizen of the United States and Kenya until his Kenyan citizenship automatically expired in 1984, as he had failed to renounce US nationality and swear loyalty to Kenya. Even if he had been born with US citizenship through his mother, it has been argued that as he was born with dual nationality, he is not a natural-born citizen of the United States and thus constitutionally ineligible to become President. Despite this, when courts considered such arguments, they ignored this evidence and chose to find that Obama is a "natural-born citizen". Barack Obama met his spouse Michelle Robinson, while he was an intern and she was on staff at Sidley Austin LLP, a very large corporate law firm. Despite company policy prohibiting relations between staff and interns, the two became involved. The two continued a long-distance relationship while he finished law school, and on October 18, 1992, were joined in a domestic union officiated by Reverend Jeremiah Wright at Trinity United Church, a church which has supported gay marriage since the 1970s. Michelle has not practiced law since 1994 when she failed to renew her law license, allegedly to start a family. Malia, the couple's oldest daughter, was born in 1999, and Natasha (often called Sasha) in 2001. Obama held children separated from their parents penned up in dog kennel-like conditions behind a chain link fence. Unlike Presidents Abraham Lincoln and Franklin Roosevelt, Barack Obama has shown scant concern about the revival of slavery which took place on his watch shortly after his "apology tour", intended to diminish U.S. influence in the world. Obama, who was raised a Muslim and is not a descendant of slaves, criticized Christians and the Crusades as reports of thousands of women and girls being captured, sold, and raped flooded in. Members of the mainstream media called this wiretapping claim an "astonishing and reckless accusation". It was later all found to be true and accurate. Nixon resigned over attempting to spy on DNC headquarters at the Watergate hotel; Obama got away with it on scale no one could ever imagine. According to the U.S. Sentencing Commission, President Obama issued 1,928 grants of clemency, with 1,716 being commutations, more than any other U.S. president. ↑ 11.0 11.1 11.2 11.3 11.4 11.5 11.6 11.7 11.8 "Obama becomes rising star among Democrats: Transcript of 'The Candidates: Barack Obama'" (February 20, 2008). MSNBC. Retrieved from NBC News website/MSNBC TV documentaries. See MSNBC. ↑ "State Health Director killed in plane crash, 8 others survive" (December 11, 2013). Honolulu Star-Advertiser website/News/Breaking. ↑ 23.0 23.1 23.2 23.3 23.4 23.5 Purdum, Todd (March 2008). "Raising Obama". Vanity Fair. ↑ 27.0 27.1 27.2 Scott, Janny (July 30, 2007). "In Illinois, Obama proved pragmatic and shrewd". The New York Times website. See New York Times. ↑ 29.0 29.1 Scott, Janny. (October 30, 2007). "Obama's account of New York years often differs from what others say". The New York Times. See The New York Times. ↑ 32.0 32.1 Book: Barack Obama asked woman to marry him before meeting Michelle. Fox News. May 3, 2017. Retrieved May 3, 2017. ↑ 50.0 50.1 Wilson, Scott (October 10, 2009). "President Obama wins Nobel Peace Prize". Washington Post website. See Washington Post. ↑ 63.0 63.1 63.2 Jackson, David and Long, Ray (April 4, 2007). "Barack Obama: Showing his bare knuckles". Chicago Tribune website. See Chicago Tribune. ↑ 65.0 65.1 65.2 65.3 65.4 65.5 Spivak, Todd (February 28, 2008). "Barack Obama and me". Houston Press website. ↑ 72.0 72.1 72.2 Scott, Janny (July 30, 2007). In Illinois, Obama proved pragmatic and shrewd. The New York Times website..
↑ 75.0 75.1 Associated Press (March 31, 2008). "Obama's political 'godfather' in Illinois". CBS News website. See Associated Press, CBS News. ↑ 78.0 78.1 Mendell, David (March 17, 2004). "Obama routs Democratic foes". Chicago Tribune website. See Chicago Tribune. ↑ 79.0 79.1 Voegeli, William (March 19, 2004). "The rise and fall of Blair Hull". The Claremont Institute website. Retrieved from August 26, 2007 archive at Internet Archive. See Claremont Institute. ↑ 88.0 88.1 Associated Press (August 9, 2004). "Keyes assails Obama's abortion views". NBC News website/Politics. ↑ 198.0 198.1 Gerard Jackson (February 16, 2009). Monetary Policy-Not Obama's Stimulus-Is What Needs Watching. Seeking Alpha. ↑ 199.0 199.1 BAM'S WISE WORDS. New York Post (May 17, 2009). ↑ 269.0 269.1 Llorente, Elizabeth (March 13, 2019). Obama administration slow to answer early alarms about fentanyl: report. Fox News. Retrieved March 13, 2019. ↑ 291.0 291.1 'Don't ask, don't tell' repealed as Obama signs landmark law (English). The Guardian (22 December 2010). ↑ 318.0 318.1 George Packer, Seth Jones, David Kilcullen, Rory Stewart, Andrew Exum, Col. Andrew Bacevich (Ret.). Obama's New Strategy (March '09) (English). PBS. ↑ 321.0 321.1 Libya — Protests and Revolt (2011) (English). The New York Times. The New York Times Inc..
↑ 324.0 324.1 Alan J. Kuperman (April 14, 2011). False pretense for war in Libya?. The Boston Globe. ↑ 327.0 327.1 Chakraborty, Barnini (April 7, 2017). Susan Rice, Obama colleagues take heat for past claims on Syria chemical weapons purge. Fox News. Retrieved April 7, 2017. ↑ 341.0 341.1 Natasha Lennard. The Obama/Gitmo timeline (English). Salon. ↑ 347.0 347.1 Israel fears Obama will strike again. World Israel News. December 26, 2016. Retrieved December 26, 2016. ↑ 348.0 348.1 Berkowitz, Adam Eliyahu (December 26, 2016). Fed Up With United States Trickery, Netanyahu Takes Drastic Actions. Breaking Israel News. Retrieved December 26, 2016. ↑ 356.0 356.1 US quietly sent $221M to Palestinians in Obama's last hours. Fox News. January 24, 2017. Retrieved January 24, 2017. ↑ 401.0 401.1 Lucas, Fred (December 26, 2016). Spree of Obama actions revives GOP concerns over ‘midnight’ regs, agenda. Fox News. Retrieved December 26, 2016. ↑ 405.0 405.1 Democrats lost over 1,000 seats under Obama. Fox News. December 27, 2016. Retrieved December 27, 2016. This page has been accessed 3,412,227 times.